The set offers all the spare parts you need if you like to film with the GoPro. Starting with a replacement cover for the housing lens, which likes to scratch, about spare screws and two different housing cover is well prepared for any uses in sports and leisure. The mounting set with adapter, elbow and adhesive pad can be attached to all round surfaces and additional flat and round adhesive pads provide more opportunities to attach the cam on a variety of smooth surfaces. The anti-fog inserts, which are ideal for combination with the waterproof housing, prevent fogging of the lens at large temperature differences. Matching the GoPro Hero 3 mantona offers a replacement lens cover. If the case of your GoPro is scratched or damaged, you can use it to easily replace your lens cover. With everything you need, including gaskets and screws. 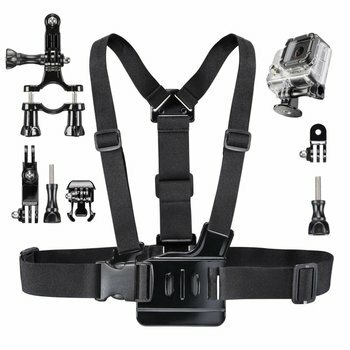 Set with the basic equipment for mounting options for the GoPro Hero. It allows quick installation on helmets or other rounded, smooth surfaces. Whether for flat or rounded surfaces - this set offers the right adhesive plates for every application with the GoPro. The panels are glued directly to the respective base, such as the helmet. The 3M adhesive surfaces guarantee secure and lasting hold. Foggy camera? No problem - that's what anti-fog pads from mantona are for. These can easily be used in your GoPro to prevent fogging in a waterproof housing in cold temperatures or high humidity.